Please accept my blessings. I beg to acknowledge receipt of your letters (2) dated 8th July, 1970, and noted the contents. Janne is still staying here and she is enjoying the company of the devotees. I know that Tirthapada is a very nice and good boy. He is ready for all kinds of service. Now you are three strong male devotees and many girls are also helping you, and I hope you have now full strength for preaching work. In future if it is so required you may have one or two more from London, but the best thing will be to recruit devotees locally--that is the success of preaching work. Regarding harassment of our devotees, Yes, this is not a new thing in the history of the world that preachers are sometimes persecuted. But at the present status of civilization I do not think anybody will be crucified like Lord Jesus Christ. Hiranyakasipu persecuted his own son and only five years old. So the demons and atheists are always prepared to give trouble to the devotees. Sometimes the demons like Kamsa are prepared to kill God even. During Lord Caitanya's time Thakura Haridasa was also persecuted and put into jail. Not only that, he was whipped in twenty-two market places, but still the demons could not come out successful in the snubbing down of the Hare Krsna Movement. So do not be worried about this. Go on about your business. Krsna will give you all help, rest assured. Simply stick to you work seriously and sincerely. Rathayatra festival was successfully performed in San Francisco, London and Tokyo also and you may write to Durlabha about the films. Regarding your question -- What does it mean: "We are all originally Krsna conscious entities." -- We are always with Krsna. Where is not Krsna present? So how you can say that we were before? You are always with Krsna and when we forget this fact we are far, far away from Him. In the Isopanisad it is clearly stated that, tad dure tad vantike "He is very away, but He is very near as well." (Iso. mantra 5). So this forgetfulness is our falldown. It can take place at any moment, and we can counteract this forgetfulness immediately rising to the platform of Krsna consciousness. Yes, your have correctly answered your second question by the purport that Arjuna's mind was already absorbed in knowing Krsna as his friend so he should not give up that status but he should only change his vision for the time in order to see the Universal Form of the Lord. Regarding the three beads missing from your set of japa beads, just string three beads in place. That is all that is necessary. Please accept my blessings. I am so glad to receive your letter undated and to know that you have gone to Sydney to execute Krsna consciousness there. Now you three combined together are strong trio, so just push on Krsna consciousness movement in Australia. You have seen in London all kinds of fluctuation in establishing our temple there. You have got sufficient experience in this connection. Now you can utilize your talent and experience in establishing a very nice temple in Sydney. Upendra has requested me to go there by January next year, so if you can make all arrangement complete by that time, certainly I shall go and install the Deity as I did in London. Please accept my blessings. I am so glad to receive your letter dated 8th July, and I was expecting to receive it every moment. So Tirthapada has gone there and that is a good news, so all of you are experienced devotees. I have already written two letters separately, one to Upendra and one to Tirthapada. Now combinedly go on with your preaching work. I am very glad to know that you are keeping your accounts up to date with BTG and the book fund. This is good and proper management. So you continue to keep these accounts weekly. I am also very glad to know that you think Melbourne a good place for establishing a temple and you are eager to accept this establishment of temples in the Australia area as your life and soul. Yes, as I have taken this work as my life and soul on the order of my Spiritual Master, similarly if you take my desires as life and soul, then the whole thing is immediately connected with Krsna. That is the meaning of Parampara system. None of the activities are personal affairs. It comes only through the proper channel, otherwise each and every activity is directly connected with Krsna. It is received through the Spiritual Master, but the business is for Krsna as much as an office superintendent is the via media for pleasing the ultimate master. Kindly execute the Deity worship very properly. Upendra has got good experience. Tirthapada has also got good experience. Follow the program as we are doing in Los Angeles and London. I think all of you are twice initiated, so there will be no difficulty in executing the Deity worship. Our Nectar of Devotion and KRSNA are already published and these two books alone can keep any one in Krsna consciousness perpetually. Please accept my blessings. I beg to thank you very much for your letter dated 5th July, 1970, along with the new blueprint of French BTG. It is very, very nicely done. The back cover pictures 1510-1970 has impressed me very much. I do now know who is making these layouts, but the things are being done nicely. Except for the face of the type everything else is done perfectly. So until a nicer edition from Paris is published your practical service to Krsna Consciousness Movement is very much appreciated by me. I have met your wife in San Francisco. She looks very bright after marriage. Actually she is the choicest girl for you, as you desired. Be happy with your wife and enhance your knowledge in Krsna Consciousness. I am sure she will be a great help in all respects. Please accept my blessings. I beg to acknowledge receipt of your letter dated 12th July, 1970, along with the blueprint for the third chapter of Srimad-Bhagavatam Second Canto, entitled, Pure Devotional Service: the Change in Heart. I have looked over the blueprint and noted a few points to be corrected, so I am sending back the blueprint to you for seeing the necessary changes as they are in the text. I have also corrected the points sent by Pradyumna and the sheet is also sent back herewith. Please accept my blessings. I beg to acknowledge receipt of your letter dated 9th July, 1970, and I thank you very much for your check for $2,000. It is a great help to me because in this month I have paid about $20,000 for printing my books and your contribution is welcome. I have also read the newspaper cuttings in which I understand that people accept our Society as genuine and religious. So it is Krsna's grace that they are giving you permission to chant on the streets. I am sure if we work very sincerely all facilities will come from Krsna. It is stated in Bhagavad-gita that Krsna personally carries the necessities of His devotee and gives protection to his status quo. So let us all believe in the words of Krsna and serve Him to our best capacity and thus we will come out victorious in every field of action. By the grace of Krsna you are a beautiful young man with nice intelligence, devotion and spirit, so employ all of them in the service of the Lord along with your good wife and be successful in Krsna consciousness. Please accept my blessings. I beg to acknowledge receipt of your letter sent through Bhagavan das dated 30th June, 1970, and the contents are very encouraging. I am so glad to know that you are an intelligent boy, happily married and now engaged in advancement of Krsna consciousness under the careful guidance of Sriman Bhagavan das. Please continue to study very thoroughly our Krsna consciousness way of spiritual life and with the help of Bhagavan das become more and more fixed up in the service of Lord Krsna. I am very happy to accept you as my disciple as you have requested and your spiritual name is Abhirama Das Adhikari. Abhirama means one who is inclined to worship Lord Rama. I have chanted your beads duly and they are returned to you enclosed herewith. Please follow the rules and regulations for progressive spiritual advancement and be sure to chant regularly sixteen rounds of Hare Krsna mantra daily. I am enclosing one sheet listing standard practices for devotees and ten offenses to avoid in the matter of chanting the Holy Names. Please transfer $636.80 (six hundred and thirty-six dollars and eighty cents) to the First National Bank of Boston, Brighton Avenue Branch, in favor of account No. 516-5642, ISKCON Press, and charge the same to my account as above mentioned. Please accept my blessings. I beg to acknowledge receipt of your letter dated 30th June, 1970, and noted the contents. I am so pleased to learn that your center is attracting so many persons some of whom are sincere. If you are sincere in your service of preaching our Krsna consciousness philosophy, other sincere souls will come. Our process is for manufacturing sincere souls. How is it possible? Simply by your kindly following the rules and regulative principles and chanting the Holy Names offenselessly. This program is given by Lord Caitanya specifically to change the hearts of the fallen souls of this Kali Yuga for picking up their spiritual life. I have received the set of japa beads sent by you. I have chanted them duly and they are sent back to you enclosed herewith. Please accept my blessings and offer the same to your good wife, Srimati Kasturika Dasi. I am in due receipt of your nice letter dated 2nd July, and I am very glad to learn that you are now happily married. I beg to thank you also for the check of your contribution for my book fund, it is very welcome at this time and for the nice photographs of your wedding ceremony. So I think you tried to get yourself married some times before and now Krsna has given you one very good wife. You are intelligent boy, hard worker and devotee of Krsna and your wife is very fine girl and sincere devotee also, so you both, husband and wife, combined together work for your mutual advancement in Krsna consciousness. That is my desire. I am very pleased also to note how you are appreciating the grace of the Spiritual Master and Krsna for guiding one in the progressive path of spiritual realization. Now both you and your wife simply carry out our instructions for keeping always engaged in Krsna activities according to strict following of the rules and regulations and chant Hare Krsna and be happy. It is so much encouraging to learn that Masturika Dasi is already helping you in your Krsna conscious work. May Krsna bless you both with advanced Krsna consciousness. Please accept my blessings. I beg to acknowledge receipt of your letter dated 6th July, 1970, and noted the contents. "So in the beginning of the creation, first of all there were the four unmarried sons of Brahma (Kumaras) and they underwent severe austerities being situated in avowed celibacy for realization of the Absolute Truth." Regarding your second point, all incarnations should be proper nouns and therefore capitalized. It does not matter whether they are Visnutattva or jivatattva, saktyavesa-avatara. or plenary expansion. The incarnations listed however may be classified as follows: Visnutattva: Kapila, Nara Narayana, Rama, Balarama, Krsna, the Purusas, the Boar, Yajna, Rsabha, Matsya, Kurma, Dhanvantari, Mohini and Kalki. Jivatattva (empowered): Narada, Vyasa, Buddha, Kumaras, Dattatreya, Prthu and Bhrgupati. Please accept my blessings. I beg to acknowledge receipt of your two letters, one dated 6th July, 1970, and the other listing Sanskrit points from Tape #43, Chapter 90 of KRSNA. So I have noted the corrections in each case and I am returning the sheets to you herewith. I am very happy to know that your family is doing well in Krsna consciousness. Please offer my blessings to your good wife, Arundhati, and your son, Aniruddha. Please accept my blessings. I beg to thank you for your letter dated 6th July, 1970, along with the blueprint copy of the Lord in the Heart. Thank you very much. It is alright to go ahead with the printing of this second chapter. I have approved all the questionable points noted by Pradyumna, so it is alright. Please accept my blessings. I am in due receipt of your letter dated 3rd July, 1970, and noted the contents. I am very satisfied to see how nicely you are rendering the transcendental subject matters of Srimad-Bhagavatam in the matter of painting pictures for our literatures. So I am very much pleased with your picture for the cover of The First Step in God Realization and if you continue to improve from this standard that will be very nice. Yes, I would ilke each and every one of our books to have pictures as many as possible. That is my desire. Our KRSNA book with pictures has been very much attractive. 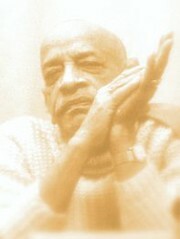 Brahmananda took delivery of only 25 copies from Japan and immediately within two days all copies were sold. It is simply to the pictures. People become attracted with these unusual transcendental pictures at first, ao even without reading the book they become inclined to purchase it. This is one point. Another point is that picture gives the explanation of the passage very quickly. So try to insert as many pictures as possible in all our books and other publications. Regarding the picture for the cover of Bhagavad-gita AS IT IS, revised and enlarged edition, yes, if the painting for the cover is similar to the picture which you sent from the Bhagavad-gita in Pictures that will be alright. Regarding further pictures for the Bhagavad-gita, if you want suggestions from me then I can give you hints with reference to important verses in the Gita; but whether you will be able to draw pictures simply by taking hints from me? For example you may take some hints like this: Dhrtarastra sitting in the palace room and his secretary, Sanjaya, relaying the activities in the battlefield with a television-like picture within his heart. The idea is that he is looking within the reflection of the battlefield and explaining to Dhrtarastra. So if somebody tries for it, then I shall send similar hints with reference to some important verses. You have inquired whether to illustrate Balaramaji's Rasa Dancing with expansions of Balaramaji just like Krsna expanded Himself for Rasa Dancing. No, we do not find such description in the Srimad-Bhagavatam. But He had His dancing pastime with the Gopis in a different place known as Ramaghata on the bank of the Yamuna. Yes, you all must read Nectar of Devotion in your spare time. I am very glad to learn that your Boston Sankirtana Movement is very successful. If you are getting enough money now, you can send some extra money to me. I have given a loan to the BTG Department for $3000, so inform this matter to Satsvarupa and if he has got extra money he may return it. All books in soft cover which we have printed should be bound each one copy and sent to me for my library. Please accept my blessings. I beg to acknowledge receipt of your letter dated 1st July, 1970, and noted the contents carefully. Regarding printing of French and German editions of BTG, Brahmananda has already made arrangement with Japan so for the time being you get the French and German editions printed in Japan. Yes, I have received one letter from Srimati Himavati and I have replied also. So accident is accident; do not be worried, be careful in future. There is a common proverb in Sanskrit that when travelling one should avoid accompaniment of women--pathe nari vivarjayet. So far her stay in the hospital is concerned, she has already written to me about this. It is good that you are carrying Prasadam to the hospital. If you and Tamala both are present at the opening of a new center that will be nice. Or you you may follow your other plan, but however you do it, do it jointly by combined consultation. If you do it jointly in this way you will get strength to decide the right thing. Another thing is that before opening a branch we must have able men also to conduct, otherwise how we can open branches? *Neither I have heard anything how you have performed Rathayatra in London. Please accept my blessings. I beg to acknowledge receipt of your two letters dated 29th June and 2nd July, 1970, and noted the contents with great pleasure. In the meantime I have written two letters addressed to both you and Acyutananda in which I wanted to know if you have changed your place. In you letter dated 29th June you wrote to say, "We shall move into our apartment the next day after or tomorrow, Acyutananda says," but in you letter dated 2nd July it appears that you have not gone there, so I am surprised why the delay. It is not possible to stay at the Gaudiya Math because we want to organize our preaching work in our own way which we are following here. So in the Gaudiya Math we will not get any facility except for staying, neither they will be able to accommodate more men who are intending to go to India. About the land in Mayapur, I have already advised Acyutananda to purchase the land at all risks. He will kindly send me report of your activities at least twice weekly. I am very glad to learn from your letter dated 2nd July that both yourself and Acyutananda went to Babu Ghat for chanting Hare Krsna. I am very glad to learn it. The same process I adopted in your country when I started my Sankirtana in Tompkins Square, New York. Krsna was so kind to send to me all these boys and girls who are helping me now. Babu Ghat is a very nice place. Similarly, in front of Babu Ghat there is the Eden Garden that is also a very nice place. After all it is not the question of the place, but it is the person who chants which is important. A sincere soul like you, so much devoted to Spiritual Master and Krsna is sure to be successful anywhere. So you adopt the same principle as we are doing here. So far collection is concerned, if somebody offers money there is no reason to refuse it. Certainly there are many pseudo-Vaisnavas collecting money for sense gratification, but that does not mean that a pure Vaisnava will not collect. Yes, get nama Sankirtana organized, it is very nice program. It is all encouraging. Nityananda Prabhu was doing this although He was attacked by Jagai and Madhai. In spite of His being injured by them, Lord Nityananda delivered these two brothers. That is the way of preaching. Certainly there will be thousands to follow a large Sankirtana Party, so you do like that. Regarding the Math, naturally because they are getting great name and fame by your service they will not like you to leave, but if more men go where they will live. I do not know why there is hesitation still. We must have our own place. I hope you have replied this point in my previous letter. As soon as you settle up in your own place, we shall send many magazines and books for distribution. So your first example of service has very much satisfied me. I have all my blessings upon you. Kindly continue this program and please keep me informed at least two times in a week. Regarding your feelings of burning impatience, these things are very explicitly explained in the Nectar of Devotion in the chapter on ecstasy. These are symptoms of ecstasy, that is not bad. Please accept my greetings and blessings of Lord Krsna. I am very much glad to know that you have recovered from an attack of cerebral thrombosis but the grace of Lord Krsna. I shall always pray for your good health and prolonged life because at the present moment you are the only hope to us in the matter of spreading India's original culture, Krsna consciousness. When you meet the Prime Minister and other Ministers of Government, kindly try to impress upon them that Krsna Consciousness movement is not a type of religion. Lord Caitanya Mahaprabhu says that everyone is constitutionally servant of Krsna or God. In the Bhagavad-gita the same thing is confirmed that the living entities are parts and parcels of God. This philosophy is very nicely explained in the Bhagavad-gita. Unfortunately Bhagavad-gita was not properly presented as it is. Therefore I have published my edition of Bhagavad-gita in English, Bhagavad-gita AS IT IS. It is published by Messrs. MacMillan and Company and people are very much appreciating this presentation, so much so that every year since 1968 they are printing consecutively. It was first published in 1968. The second printing was in 1969 and yesterday I saw that they have printed for the third time in 1970. So I am very glad to repeat that our Krsna Consciousness movement has met with considerable success here in America and Europe. We have got up til now 33 temples in America, Europe, Japan and Australia. In America specifically we are increasing one center practically every month. Very recently we have opened our center in Chicago. I am sending per separate air mail parcel one copy of your magazine, Back to Godhead. Perhaps you remember that this was being published from Delhi when I was there and sometimes you were very kind to give some contribution to this paper. I hope you will be very much pleased to see the present status of the paper. We are publishing this paper in English 120,000 copies per month and lesser quantities in German, French, and Japanese. We have got branches not only in London, but also in Paris and Tokyo and everywhere this Krsna Consciousness Movement has spread by the simple process of chanting the Maha mantra--Hare Krsna, Hare Krsna, Krsna Krsna, Hare Hare; Hare Rama Hare Rama, Rama Rama, Hare Hare, and speaking some philosophical topics from the Bhagavad-gita AS IT IS is getting very good response. Perhaps you might have seen in the Kalyana of Gorakhpur an article about us, International Society for Krishna Consciousness, in the April 1970 issue. They have very nicely presented news about our activities. As a result we are getting many inquiries from India. The former Ambassador of U.S.A., Sri B. K. Nehru, who may be at present moment Governor in Assam, knows me very well and about my movement and Sri Apa B. Pant, the High Commissioner of India in England, knows me very well and about my movement also. Within the magazine I am sending you one photograph of my meeting with Sri Apa Pant. So this Krsna Consciousness cultural movement is not actually Hindu movement, but originally it is India cultural movement. Krsna does not claim Himself either as Hindu or anyone else, but He claims to be the father of all living entities. The people of the world now require this cultural movement for actual peace and prosperity. In the Caitanya Caritamrta it is said that Krsna consciousness is not a foreign thing which is imposed by force, but is dormant within everyone's heart, simply it has to be awakened by the authorized process. The authorized process is chanting of the Holy Name as it is recommended in all the Vedic literatures, and it is being effective amongst the people whose background is neither Hinduism nor Indianism. Because it is the natural propensity of all living entities it is being accepted by all classes of men without any distinction of caste, creed, or color. Such a great cultural movement originated from India and Mahatma Gandhi, the father of the Indian nation, was always carrying with him the Bhagavad-gita. Then why the Indian Government will not give its full support for this great movement? The Gandhi Memorial Fund has got immense amount of money, the Cultural Department of the Education Ministry of the Indian Government is spending so much money and why not for the real Indian cultural movement, Krsna Consciousness? So kindly try to convince the Prime Minister and take up this matter very seriously because by the spread of this cultural movement India's prestige will be glorified. Bhagavad-gita although accepted as Hindu gospel is not limited with the Hindu community. All over the world this book is studied. There are hundreds of foreign editions of this book and actually I am seeing how they are anxious to receive this culture. If you want more information I shall be very glad to supply you, and you please try to help this movement for the remaining days of your life. Both of us are now old enough. I shall complete my 74th year by the next month and you are of the same age, so let us do something combinedly for the remaining days of our life so that our mother India may be glorified all over the world. I wish to go to India early next year with some of my students, twenty-five to forty, to demonstrate their spiritual advancement and behavior to our men in India. I will be glad to know if you will cooperate on this attempt. On hearing from you I shall be glad to supply you more information about this. Hope this will meet you in good health and thanking you in anticipation. Please accept my blessings. I beg to thank you for your encouraging letter dated nil. You opening a new center of ISKCON in Atlanta, Georgia, has given me great transcendental pleasure because it is Lord Caitanya Mahaprabhu's desire that in every city and town and village of the earth there shall be the chanting of the Holy Names of Krsna. It is very good news that you have so quickly found a suitable house for our purpose that is very well situated. Now that you have earned the respect of the city authorities you must push this Sankirtana movement very vigorously and to the best of your capacity and Krsna will give you more and more intelligence how to do it nicely. Yes, everyone will be impressed with the sincerity of our students because they are actually advancing in spiritual life. Our program is not a bogus thing, it is the eternal reality of transcendental life of full bliss and knowledge in the service of the Lord. So it is not very wonderful that your sincerity is noted by the authorities, any sane man will have to admit that our program is the sublime. So as you are given full facilities for the execution of Sankirtana activities you must do it wholeheartedly and especially try to encourage the hippies to accept this Krsna consciousness movement. They are our best clients. They are feeling very keenly the frustration of material life and it is our duty as good Vaisnavas to be very sympathetic with them and bring them to take up this Krsna consciousness, then their lives will become perfect and our mission successful. I have read the article sent by you cut from the newspaper and it is very nice. They have presented some of our philosophy very nicely and favorably. I beg to thank you also for the check which you have sent as contribution to my book fund, I think it was for $50. Regarding your questions: Hindu means the culture of the Indians. India happens to be situated on the other side of the Indus River which is now in Pakistan which is spelled Indus--in Sanskrit it is called Sindhu. The sindhu was misspelled by the Europeans as Indus, and from Indus the word "Indian" has come. Similarly the Arabians used to pronounce sindus as Hindus. This Hindus is spoken as Hindus. It is neither a Sanskrit word nor is it found in the Vedic literatures. But the culture of the Indians or the Hindus is Vedic and beginning with the four varnas and four asramas. So these four varnas and four asramas are meant for really civilized human race. Therefore the conclusion is actually when a human being is civilized in the true sense of the term he follows the system of varna and asrama and then he can be called a "Hindu." Our Krsna Consciousness Movement is preaching these four varnas and four asramas, so naturally it has got some relationship with the Hindus. So Hindus can be understood from the cultural point of view, not religious point of view. Culture is never religion. Religion is a faith, and culture is educational or advancement of knowledge. Regarding your second question how to convince the young persons who are thinking that Meher Baba is an avatara. it is very difficult to deal with these misguided people. If you meet sincere people you may inform them that we are concerned with Krsna Who is historically 5,000 years old. So any other party who comes from India or any part of the world cannot claim such long history as far back as 5,000 years. There are sometimes manufactured avatara. in the history of the Vedic literature, but we don't accept them. We take the oldest one which is genuine--that is Krsna consciousness. We are not interested in anything newly manufactured. If Meher Baba or for the sake of that, any other Baba claims to be Krsna, so why any intelligent man will go to the substitute leaving aside the original? Please accept my blessings. I beg to acknowledge receipt of your letter dated 29th June, 1970, and noted the contents. I am very glad that you are all devotees working hard to improve the temple in both appearance and program. I understand that you are doing very nicely on Sankirtana Party and now you have been able to purchase a Sankirtana van for travelling. So you do this work of pushing on Krsna consciousness movement very enthusiastically and Krsna will help you to overcome all impediments in the matter of discharging your sincere devotional service to the Lord. I am especially happy whenever I learn that my books and literature are being widely distributed, so it is very good news to learn that you are also selling so many of our literatures. In this connection, however, you should see that the daily sales are recorded duly and at the end of the week the amount owed for these sold literatures should be sent by check to L.A. I have already advised these things to you in my letter sent last week. Anyway, the idea is that now we are increasing in size of our organization and also our expenditures for literatures are increasing so we must do everything very carefully so that there will not be any difficulty. You have written that your temple is like an oasis in a desert. Yes, it is a fact that our temples are providing shelter from the burning forest fires of material existence. It does not matter poor quarter or richer quarter, our temples are nothing to do with any material situation. They are situated in the Spiritual sky and as such they are the only alternative offering relief from the miseries of all kinds of material conditions of life. So encourage people to come and spend time with us in the temple and become purified from all contaminations and anxieties. Everyone is suffering from thirst for spiritual life or Krsna consciousness and it is the temple which can offer them Krsna Consciousness to satisfy their thirsting. Regarding your temple schedule of study, it is alright so continue your classes regularly and try to understand the philosophy as it is--that is required. I have been informed by Devananda that your wife has borne you one nice son. So this is very good news. You may give him the name Nirmala Candra. Nirmala means without any flaws or without contamination and Candra means moon. So the name Nirmala Candra refers specifically to Lord Caitanya who is known as the Spotless Moon of Gauda. Now you, husband and wife, must work together combinedly with great responsibility for raising your new child in ideal Krsna consciousness. Children learn by imitation of their parents, so if you both set Krsna conscious example the child will very naturally and easily become advanced in Krsna consciousness by following. Please offer my blessings to your good wife, Laksmimoni, and your son. Regarding your several questions: Where are the spirit souls coming from that are taking microbe bodies? It is not a matter of any particular body. These spirit souls and all spirit souls are coming from Vaikuntha, but in these material worlds they are taking various grades of bodies according to their material activities. There is no "new" soul. "New" and "old" are due to this material body, but the soul is never born and never dies, so if there is no birth how there can be new soul? Your second question: Is there any particular reason why some spirit souls become directed toward Krsna Consciousness in the first place? How does one get on the progressive path of elevation to Krsna Consciousness? The answer is that it is by the mercy of the Lord that one comes in contact with a Spiritual Master Who can revive the dormant Krsna consciousness of the conditioned soul. Krsna is always merciful and He comes Himself, He leaves behind Him instruction like the Bhagavad-gita, etc. and He sends His representative, the Spiritual Master. In this way the merciful propaganda is going on. Every individual soul has got the discriminating power, so those who are pious they take advantage of this opportunity of the mercy of the Lord. But both pious and impious souls are being convinced by this Krsna consciousness movement. The human being is supposed to be intelligent more than the animals, so the intelligent persons or pious persons are coming in contact with Krsna consciousness. Regarding your questions with reference to B.G. III,5, and the Vedic hymn quoted in the purport to B.g. 14.15 and the statement ". . . when the living entity is bewildered in his desires, the Lord allows him to fulfill those desires . . ." You have quoted, "The Lord engages the living entity in pious activities so he may be elevated. The Lord engages him in impious activities so he may go to hell . . ."
So that is also originally the individual soul's desire and as Supersoul the Lord is giving everyone the opportunity to go to heaven or to hell or to Vaikuntha if he so desires. For those who are hankering after material opportunities the Lord as Supersoul is giving them the opportunities to enjoy the material nature and the facility is being supplied by the material nature. Similarly, a living entity who is desiring for spiritual upliftment, the Lord is giving him the opportunity of the Vedic literatures and the Spiritual Master. But His advice to all living entities is to give up all nonsense and everything else and surrender unto Him. The living entity by accepting one kind of opportunity is going to hell and by accepting the other kinds of opportunities he is going back to home, back to Godhead. So both opportunities are offered by the Lord. Therefore indirectly you can say that one is being sent to hell and one is being sent to the spiritual world by the Lord--but He is simply supplying the opportunities to everyone as he desires. The intelligent person therefore does not desire anything--he simply surrenders unto the Lord or he desires to serve the Lord and that is his greatest opportunity. "Man proposes and God disposes." That is the sum and substance. But as a pure devotee of the Lord you should not propose--simply accept His proposal and surrender unto Him. So far the conditioned soul is concerned the same opportunities are there, but if he does not take advantage of the opportunity to elevate himself to Krsna Consciousness and chooses to misuse his independence for taking the opportunity to enjoy some material happiness, then he will remain conditioned as the Lord will allow him to fulfill those desires. The opportunity is always there, just as we are offering so many ways to become Krsna Conscious, but if you don't take the opportunity what can I do. That is purposeful negligence of duty. The example may be given of a man who is sleeping. If he is actually sleeping, he may be wakened by various means, but there is no doubt that he must wake up. However, if a man is pretending to be asleep there is no way at all to rouse him up.